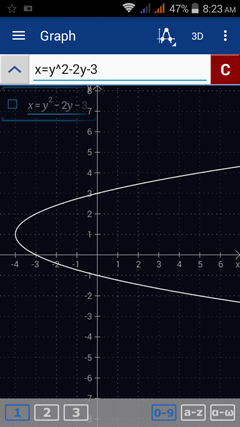 The inverse of a function is symmetric with the original function across the line y = x because in the inverse, the independent and dependent variables switch places. 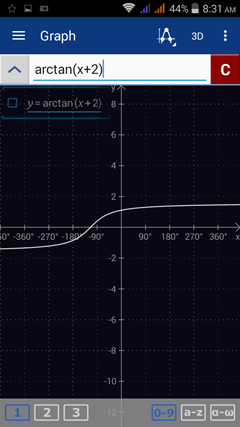 To graph the inverse of a function, express the function in the form "x =" in terms of y. Enter the equation as given with one equation per line. You can trace the values of an inverse function x = f(y) by tapping the x-axis and dragging the line up or down. 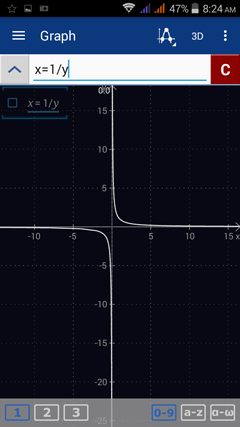 Find the inverse of each function below. 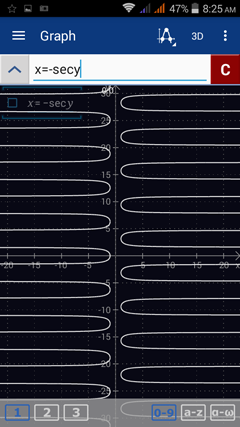 Set up Graph mode by going to Menu > Graph. Enter the equations by replacing x with y. Type y by tapping the x variable key twice. ​To graph inverse trigonometric functions, make sure that the trigonometric functions (sin, cos, tan) are displayed. If not, hold the π key. Enter equations as they are given in the problem. If the argument is longer than one term, enter it in parentheses. Note that a -1 exponent such as in the expression sin^-1 means to take the inverse of sine which is arcsine. ​Graph the following inverse trigonometric functions. Enter each of the following. 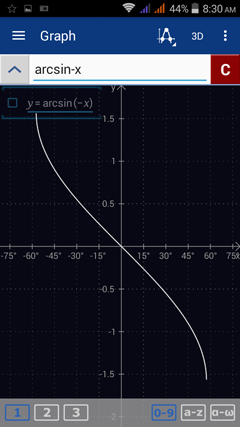 Type arcsin by tapping sin twice. Type arccos by tapping cos twice. 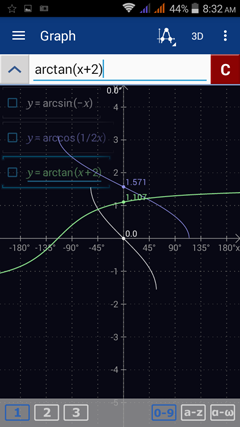 Type arctan by tapping tan twice. To graph the inverse of hyperbolic functions, make sure that the hyperbolic functions (sinh, cosh, tanh) are displayed. If not, hold the e key​. Enter equations are they appear in the problem. If the argument is longer than one term, enter it in parentheses. 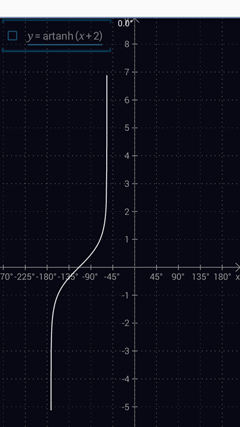 Sketch the graph of each inverse hyperbolic function. Type arcsinh by tapping sinh twice. Type arccosh by tapping cosh twice. Type arctanh by tapping tanh twice.